The Queen of Water by Laura Resau & Maria Virginia Farinango. Review: What do you think of when you're thinking about queens? Do you think of the rich, famous, and elegant? Or do you think of the smart, charming, and powerful? Well, with this queen, those descriptions are completely opposite. She is an indigenous, poor girl in Ecuador. And, she isn't the Queen of England or France, but Water! The Queen of Water is Maria Virginia Farinango. She is actually a real person, and this is a true story. Maria's life story is told by the authors, Laura Resau and Maria Virginia Farinango. Maria Virginia Farinango, or "Virginia," is an indigenous, farmer in Ecuador. She is only seven years old when she is taken to be a servant for a "mestiza," or higher-class person. There she stays and grows up. During her time there, her master "La Doctorita" beats her many times and makes her learn Spanish. "La Doctorita's" husband, "Niño Carlitos" treats Virginia much nicer, when he isn't drunk. As she is growing up, she learns how to read, write, and learns about science. Soon, when Virginia is fifteen years old, she leaves "La Doctorita" and "Niño Carlitos" and goes back to her family. Unfortunately, she doesn't remember much of her original language, so communication is hard. But she still goes to school, gets a job, and makes friends. Soon she moves out and goes to live in the hotel in which she works. Virginia quickly is at the head of her class in school, and eventually she competes in a beauty pageant where she is crowned, "The Queen of Water!" The Queen of Water is one of the best books I've ever read! It's amazing how it is a true story! The Queen of Water shows us how other cultures work and how we are very lucky to have what we have. The authors did a phenomenal job with descriptions; it's like you're actually with Virginia as things happen! The character development really grew quickly in every sentence. Virginia starts out as a poor uneducated girl, and grows into an intelligent young woman. I love the fact that the characters and places are so realistic. After you read the book and walk outside, you feel like you just walked out of a whole other world. The greatest part about this story is that it's true; it actually happened! The Queen of Water might be a more interesting or relatable story for girls because it talks about the physical development of girls. But in general it is a great book fro everyone to read. I give this book two thumbs up! We would like to thank Random House for providing a copy of The Queen of Water for this review. 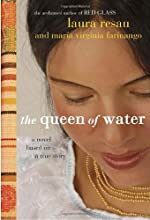 Have you read The Queen of Water? How would you rate it? I love this book! !I want to read laura's other books sometime.